When a man proposes to a woman, he expects it to be the happiest day of his life. He imagines himself getting down on one knee, popping the ring box open, and asking his dearly beloved to enter a Holy contract with him. Ideally, her eyes would fill up with tears as she rushes to say yes as many times as she can. The couple would hug and he would place the ring on her finger, indicating their impending marriage. Later, they would update both of their families on the announcement, and their union would be celebrated in a warm, loving environment. The video starts with someone filming a man who decided to propose to someone who I am assuming is his girlfriend. 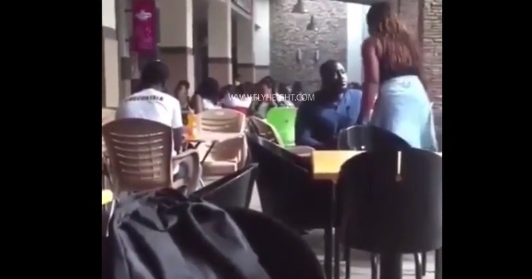 The woman can be seen saying something and the man drops his head into his hand. She made like she was going to walk away, a clear sign that the negotiation is not going as planned. They begin to argue and the man stands up, but as he is doing so the woman splashes a glass of water on him. You can’t really hear what they are saying so we’ll never know what they are arguing over. However, I can assure you of one thing, she definitely did NOT say yes. There are some situations in which a simple “no” would have sufficed, and this is one of them. I don’t know why this woman felt the need to embarrass this man in public, or why she didn’t just say that they should discuss things later and in private. Perhaps he did something wrong? Maybe she had repeatedly impressed upon him that she wasn’t ready and he went behind her back to do it in public so she couldn’t say no? There are a lot of variables here but one thing is for sure, there will not be a wedding any time soon. Do you feel bad for the guy? How would you have responded to this situation if you had been on the receiving end on this kind of disrespect? Let us know your opinion in the comments!